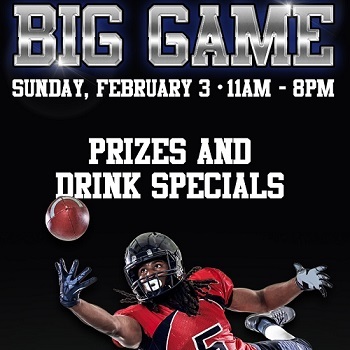 Join us at Thunder Road Steakhouse & Cantina for the Big Game! PLUS – Thunder Road will giving away prizes ALL DAY, 11am – 8pm. Prizes include: t-shirts, cozies, glasses, coolers, concert tickets to REO Speedwagon and to Midland. Grand Prizes include a television and a Valentine’s Getaway Package for Two (dinner for two and a hotel stay on Thursday, 2/14/19). No purchase necessary to win, just come hang out and enjoy the game with us! Must be present to win.